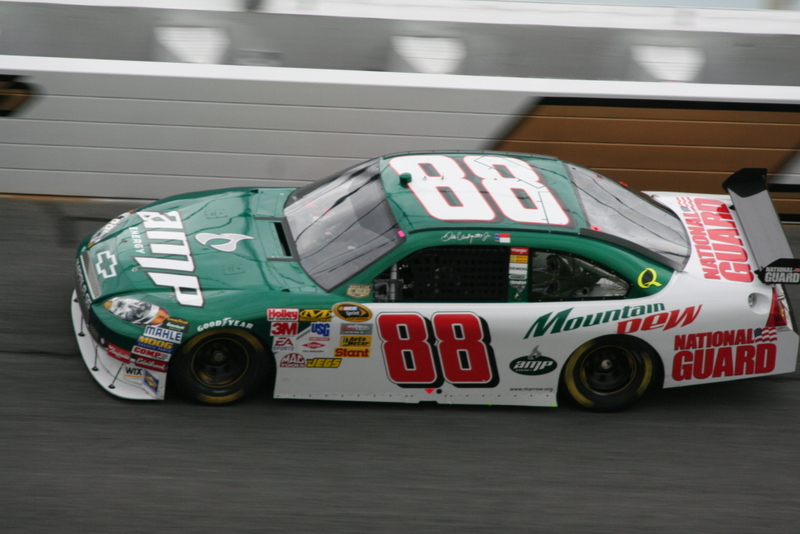 The Otaku House: Dale Earnhardt Jr.
A lot of sports fans don't view NASCAR as a sport. There are times where I even say it's not a sport even though I know better. Driving a car at 160 miles per hour through a space that's slightly smaller than parking spot and doing the same thing for 400 miles while dressed in a full fire suit and possibly losing four pounds in the process because you might not be able to hydrate yourself properly is an effort. Especially when you consider that these cars aren't exactly designed for comfort, but for speed and safety. NASCAR is an endurance sport if not a brute-force sport. I say all of that because the typical assumption is that NASCAR is just a bunch of good ole boys driving around. Well, it's not. Maybe it used to be (and maybe part of it still is), but it's a bit more complicated now. Any time Dale Earnhardt Jr. takes the lead at Talladega you can hear it. Fans cheer like crazy. You'd think that Dale Jr. was born in Alabama. You'd think he was the mayor, governor, and president all rolled into one. But Dale Earnhardt Jr. is an enigma. His popularity among NASCAR fans trumps Tim Tebow's popularity in the NFL. Dale Earnhardt Jr. has won NASCAR's most popular driver award nine consecutive times despite only winning one race in the last five years. And he has never won a championship. So he's kind of like the Cleveland Browns of NASCAR. He had his best years from 2000 to 2006 and then another decent season in 2008. I guess you could even call 2011 a bit of a decent season because he did manage to get more top five and top ten finishes since scoring his most recent victory in 2008. Unlike football or basketball or any other major American sport, there are no "franchises." The only thing that comes close to a franchise in NASCAR is a crew chief, a car owner, and a sponsor. If Dale Earnhardt Jr. doesn't win a championship there won't be another Dale Earnhardt Jr. along the line. That's it. There will not be someone else who will step into Dale Earnhardt Jr.'s uniform and win one for him. Now I know that "Tebowing" is popular now, but that is just a fad. Dale Earnhardt Jr. is so immensely popular that when Dale Earnhardt Jr. was in second place and about to pass Jeff Gordon with four laps to go when a caution came out in the 2004 Aaron's 499 at Talladega (also known as "Junior Nation" because of how popular he is down here), a rule was changed to ensure that no race can end under a caution unless the white flag has already been taken. Fans threw stuff at Jeff Gordon because he won while Dale Jr. was essentially robbed of the win. So NASCAR invented overtime (or "overdrive") because of that little situation. So... why would a driver with so little success on the track be considered NASCAR's favorite driver? Well, part of it is because of his father. Dale Earnhardt Jr.'s father was a seven-time NASCAR champion. The only other person to win seven championships is the King, Richard Petty. That is the best company anyone can share. But anyone with a brain should know that Dale Jr. will only win a championship if something miraculous happens. Hell, the most anyone can ask for is for him win one freaking race. I really don't know why I root for him half the time. Ah, hell. All I can say is go Dale Earnhardt Jr. Get us a win.